Did you know that Konnan was in US Navy for 7 years and fought in Lebanon?.. Konnan offers his sincere thanks to the fans for the donation drive that led to his Kidney Transplant Surgery..
Konnan explains in detail his 23 days in the hospital battling his body rejecting the kidney, developing high blood pressure & diabetes, his bladder filling up with blood, and more..
Discusses his medical expenses, details behind broken promises TNA made to cover his surgeries.. Confirms Homicide being fined by TNA for sending him a Myspace message showing love and support with his recovery..
How TNA accused Konnan of blackmail, and why he is suing TNA. Keep in mind all these issues occurred while Konnan was suffering from his life threatening kidney ailment and hip replacement.. Details how TNA ignored the entire donation drive for Kidney Transplant..
Story behind 'James Storms' Night', Jeff Jarrett's attitude towards roster, disgruntled wrestlers in locker room, more..
Konnan explains why he's speaking to Congress, news media and more battling steroids issues in wrestling..
Konnan rips Ken Kennedy and other WWE stars who criticized his (and others) TV appearances. He also intelligently explains why neither WWE or TNA should be upset at his appearances in Congress and news media.. 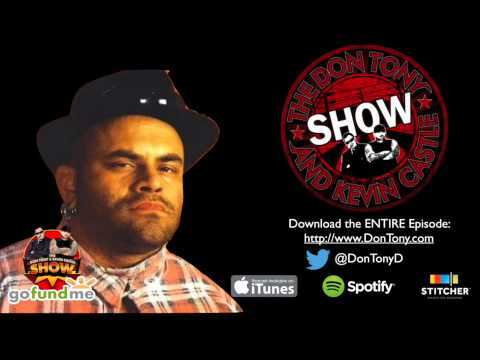 He compares WWE and their 'suspensions' to NBA towards referee scandal, and Atlanta Falcons towards Michael Vick..
Konnan comments on WWE main eventers, and their very muscular CEO..
Konnan discusses why steroids is an addiction and needs to be eliminated completely. Not one ounce should be allowed by WWE..
Konnan rips Eric Bischoff, Jarrett, and their 'blogs' on steroids issue..
Konnan rips Jeff Jarrett and how he was treated by JJ while he was battling his life threatening issues..
Konnan praises Ring Of Honor and AAA, their locker room, product, and more..
Konnan discusses how it appears WWE has moved on from marketing smaller Heavyweight Champions like Eddie Guerrero, and Rey Mysterio. He also explains how pissed off he was at WWE and how they used Eddie in storylines following his death..
Konnan also offers his Political views towards government, keeping it real to fans and friends..
Interview wraps up with another sincere thank you to everyone who has helped him thru this life threatening crisis. To him, it makes his 20+ year career all worth it. Trust me when I tell you this. Konnan will do other wrestling interviews. Take it from someone who has developed a friendship with Konnan. This is a must listen. And we ask everyone to help once again in his serious time of need. Both myself and Georgian Makropoulos of Wrestlingfigs.com led the last donation drive that raised close to $16,000 for Konnan's Hip Replacement Surgery. And every penny raised went towards that surgery. Both of us are extemely humbled by everyone's help and genorosity with that drive. We are about to commence a second drive for Konnan. He has incurred thousands upon thousands in medical expenses due to his medical complications. His Kidney Anti-Rejection Drugs. He has developed Diabetes as a result from his complications. Not to mention he cannot work for several more months as a result of this surgery. I hope we can all get together one more time and do it for this man. Feel confident that $1, $5, $10 is never too small to send. As Konnan has said himself. He had thousands of donations of just $1. $5. Every dollar adds up. A Paypal account and email address (GetWellKonnan@aol.com) has been setup so everyone can send donations. Every penny donated will go towards Konnan's Kidney Transplant Surgery. If you do not have a Paypal account, setting one up takes 5 minutes. If you prefer to send a donation by mail, an address is listed at the bottom of this article. For Paypal Donations, click the button link below. CLICK HERE for donation information and PAYPAL links for Konnan. With 2007 being filled with tragedy and scandal, Konnan's road to a healthy recovery and your help is one thing we can look back on and smile about. January 6th happens to be Konnan's birthday. January 6th also is the 20 year anniversary of Konnan's pro wrestling debut. Most of us celebrate birthdays and anniversaries with parties, gatherings, and cake. On January 6th, Konnan will be spending his time performing Dialysis on his Kidneys and preparing for Hip Surgery scheduled for Monday January 8th. It is very difficult to ever get the wrestling community together for any reason. I am hoping under the circumstances this can happen. By now you are aware Konnan needs a Hip Replacement. As unfortunate as that may be, his severe pain and degenerating hip probably saved his life. It was the very preparations for hip surgery that led to the discovery Konnan is in need of a kidney transplant. And fast. This past Thursday, Konnan appeared on our webcast and spoke about his ailment. And as doctors told him, if the kidney ailment was not discovered, he likely would have went into cardiac arrest in a matter of months. Many of you saw Konnan on TNA Impact very recently. Since that appearance, Konnan has lost 35 pounds. As he described, this illness is literally eating his muscles away. To the credit of many caring fans, some have offered their Kidney for transplant. If you are O Negative which is Konnan's blood type, or even O Positive, you could be a donor. Unfortunately, the cost for Kidney Transplant surgery is in excess of $35,000. Konnan does not have any medical insurance. Konnan is planning on having the surgery in Mexico because of the lower cost. In the United States, Kidney Transplant could cost $80,000 to $100,000. TNA made a very generous gesture to Konnan by loaning him the money for his Hip Replacement Surgery. However Konnan is on his own with his Kidney Transplant. With his blessing, we have set up a drive to raise money to cover the expenses so Konnan can have his Kidney Transplant. There have been countless numbers of fans, wrestlers, websites, and wrestling companies wanting to help Konnan in his true hour of need. Now you have the opportunity to do so. Donate $1, $10, $100, anything you can send. Can you imagine if every wrestling fan sent even $1? The cost for his surgery would be paid in a second. Paypal will convert all overseas currency to US Dollars. Anyone that has a wrestling item, memorabilia, anything they would like to donate, please send your information to Anthony DeBlasi @ baybkge@aol.com. We will place all items on Ebay and all revenue from those sales will be given to Konnan as well. Again it is very difficult to ever see the wrestling community come together for any reason. I am hopeful that in this case it will. There is no excuse why every fan, website, wrestling company, wrestler doesn't take a moment to help this man out. We've set up all avenues on behalf of Konnan so assistance can be made for him. Now it is up to you. I strongly recommend you listen to Konnan's appearance on our show Thursday evening. It brought a tear to many eyes. Konnan has done so much for the wrestling world over the last 20 years. Let's return the favor and show our appreciation to Konnan. Note: For anyone that wishes to download Konnan's appearance instead of streaming it online, RIGHT CLICK AND SAVE to download the audio. The Minority Report invades The Masked Maniac Show! What started out as a show filled with generic corny ethnic stereotypical jokes, the last 110 minutes were absolutely awesome. Listen to some very interesting discussion on TNA and WWE thru the eyes of a wrestling promoter. Interesting debates, discussion, and very revealing behind the scenes stuff regarding both promotions. You'll be surprised what you hear. And for those that may have not been able to hear our interview with Konnan the last few days, it's included in this episode as well. A very enjoyable 2 hours and 6 minutes.. Hosted by The Masked Maniac, Anthony 'Don Tony' DeBlasi, Joey 9:24 and Mo Black.